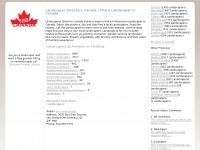 Welcome to Landscaper and Gardener Directory of Canada. The web server used by Canlandscaper.ca is located in USA and run by Unified Layer. On this web server 66 other websites are hosted. The language of those websites is mostly english. The Canlandscaper.ca websites were developed using the programming language PHP and served by a Nginx server. XHTML 1.0 Transitional is used as markup language on the webpages. Indexing the data of the website and following hyperlinks on it is explicitly allowed by robot information.